The Skeleton to which the Mesh belongs must have boundaries defined in it. Boundaries are automatically defined at the exterior edges and corners of all Skeletons when they're first created, so this isn't usually a problem. Boundaries cannot be defined directly on Meshes; they must be defined on Skeletons. The Fields to which the boundary conditions apply must have been defined in the Fields & Equations Page. The Equations to which the boundary conditions apply must have been activated in the Equations Page. The Boundary Conditions Page is shown in Figure 3.21. At the top is the Mesh Chooser, which selects the Mesh (and the Skeleton and Microstructure in which it resides) to which boundary conditions will be added. Below the Chooser is a set of buttons for manipulating conditions, and below that is a list of the existing boundary conditions in the Mesh. 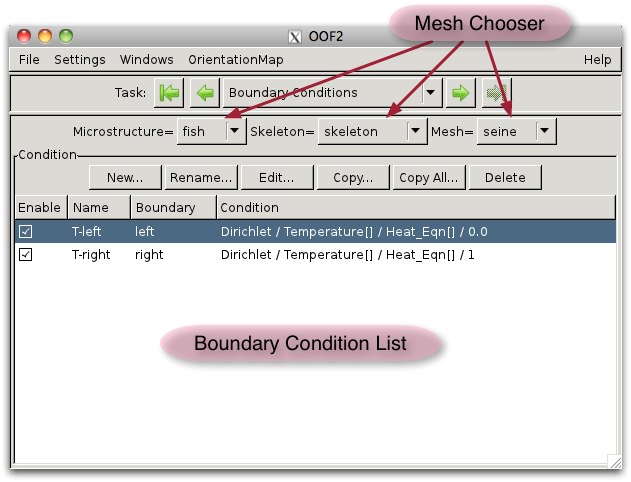 The Boundary Condition Pane lists all of the boundary conditions assigned to the current Mesh. Clicking on an entry in the list selects it. Double clicking on an entry is the same as selecting it and clicking the Edit button. The buttons above the list operate on the selected boundary condition. The New button creates a new boundary condition. The button brings up a dialog box, shown in Figure 3.22. The OK button creates a new condition with the specified parameters, and closes the dialog box. The Apply button creates a new boundary condition but does not close the dialog, allowing further conditions to be created. The Cancel button closes the box without creating any more boundary conditions. Clicking OK immediately after Apply will create two identical boundary conditions, which may cause a conflict. It is an error to try to solve a Mesh containing two Dirichlet or two floating boundary conditions that apply to the same degrees of freedom on the same boundary. Conflicting boundary conditions can be created in the Boundary Conditions page, but the conditions will have to be edited or disabled before the Mesh is solved. The Rename button renames the currently selected boundary condition. The Edit button brings up a dialog box for editing the currently selected boundary condition. All of its properties other than its name can be changed. The Copy button copies the currently selected boundary condition. It can be copied to another boundary in the same Mesh, or to another Mesh. If the current (source) Mesh is the same as the destination Mesh, then the copied boundary condition will be automatically selected in the list. The Copy All button copies all of the boundary conditions from the current Mesh to another Mesh specified in a dialog box. The Delete button deletes the currently selected boundary condition from the Mesh. 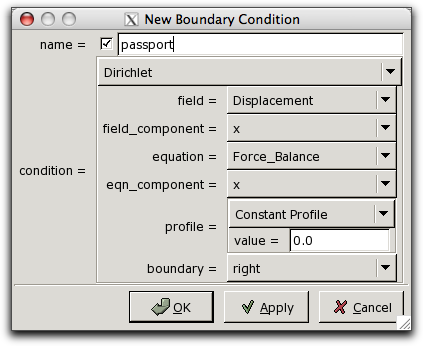 The first column of the boundary condition list contains checkboxes that enable and disable the boundary conditions. New conditions are automatically enabled. Disabled conditions will not be used when the Mesh is solved. The boundary condition list can be sorted, either by the names of the boundary conditions or by the boundaries to which they're applied, by clicking on the column titles at the top of the list.